You will find the standalone variants under File → Create → Type of Script in the image menubar (see the figure below). Menus have been reorganized. A new Colors-menu appears. It groups together all scripts that work on colors, for example tools that adjust hue, saturation, lightness..., filters...etc. Filters-menu and Script-Fu-menu are merged in one Filters-menu and it is organized according to new categories. 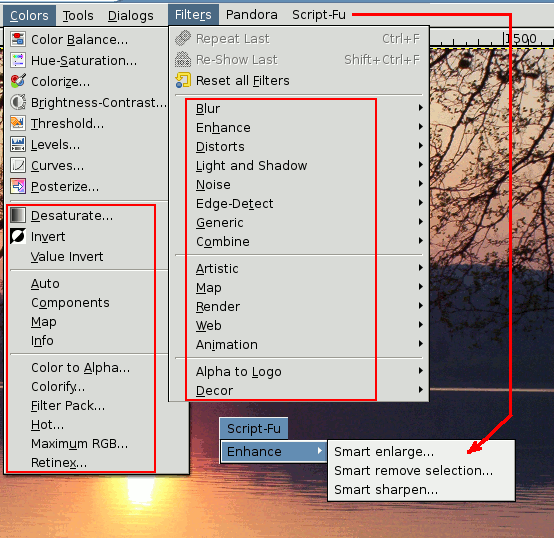 Image-dependent Plug-ins and Script-Fus are now disseminated in the image-menus. For example, Color to Alpha filter is in Colors-menu. At the beginning, it's disconcerting, but you finish to get used to this because it's more logical. The figure below show where you can find them in the image-menu.